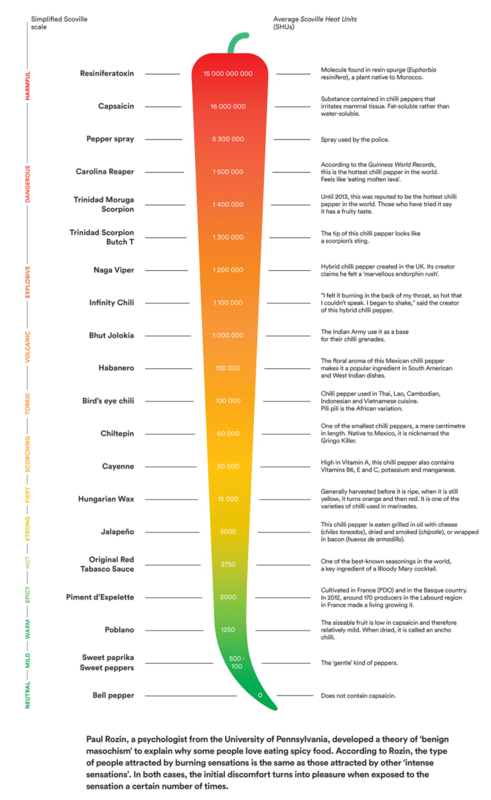 The Scoville scale is a measure of the ‘hotness‘ of a chilli pepper or anything derived from chilli peppers, i.e. hot sauce. The scale is actually a measure of the concentration of the chemical compound capsaicin which is the active component that produces the heat sensation for humans. The name capsaicin comes from the scientific classification of the pepper plant, a type of fruit, that belongs to the genus Capsicum. Capsaicin (8-methyl N-vanillyl 6-nonenamide) occurs naturally in chilli peppers together with a number of very similar compounds referred to generically as capsaicinoids, it is the precise ration of these capsaicinoids which causes the differences in taste reaction to different pepper species, for example the typical delayed reaction to the habanero pepper (C. chinense) as compared to other species. The scale or test is named after Wilbur L. Scoville (1865-1942), who developed the Scoville Organoleptic Test in 1912 while working at the Parke Davis pharmaceutical company. As originally devised, a solution of the pepper extract is diluted in sugar water until the ‘heat’ is no longer detectable to a panel of (usually five) tasters; the degree of dilution gives its measure on the Scoville scale. A sweet pepper, that contains no capsaicin at all, has a Scoville rating of zero (no heat detectable even undiluted); whereas the hottest chillies, such as habaneros have a rating of 300,000 or more, indicating that their extract has to be diluted 300,000-fold before the capsaicin present is undetectable. Nowadays, capsaicin concentrations are determined using more scientific methods, typically High-Pressure Liquid Chromatography (HPLC). The direct measurement of capsaicin gives much more accurate results than sensory methods. The Scoville rating or ‘hotness’ of fresh chillies is obviously dependent upon the variety of pepper but even within one particular variety the hotness can vary greatly, this is particularly so of the habaneros where a 10 fold variation is not uncommon. Factors influencing the heat of a fresh pepper include growing temperature, hours of sunlight, moisture, soil chemistry, and the type and amount of fertilizer used. The heat of dried peppers is equally dependent upon all of these factors as it was growing plus the conditions under which it was dried. Until recently the Guinness World Records had the world’s hottest chilli pepper as the Red Savina Habanero. Generally, these peppers range from 350,000–570,000 Scoville Units as compared with a score of 2,500–5,000 for the jalapeno pepper. The record-breaking pepper was produced by GNS Spices Inc in 1994 in Walnut, US and measured at 577,000 Scoville units. Recently however several super-hot peppers have challenged for the record. Experts at the Defence Research Laboratory in the army garrison town of Tezpur in the North-Eastern state of Assam, claimed a locally grown Naga Jolokia in testing was nearly 50 per cent more pungent than the red savina habanero at a blistering 855,000 Scoville units. However, this remained unsubstantiated. Seeds of the same Naga-Bih Jolokia pepper (sometimes also called the Bhut Jolokia) cultivated at New Mexico State University have stood-up to testing and in February 2007 a specimen registering a staggering 1,001,304 Scoville heat units was officially acclaimed by the Guinness World Record as the new worlds hottest pepper. Naga Jolokia is nearly twice as hot as the previous holder, the Red Savina.